In pictures: An injured survivor is stretchered away to a waiting ambulance outside the security entrance to the US Embassy in Ankara, Turkey 01 February 2013. At least two people have been killed and two injured in an apparent suicide bombing. 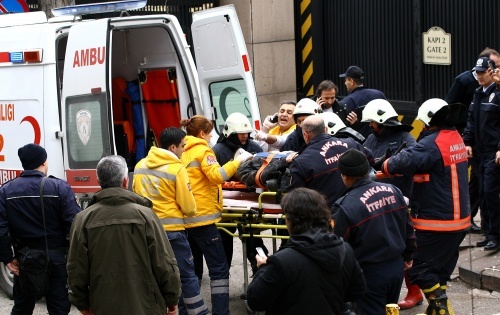 An injured survivor is stretchered away to a waiting ambulance outside the security entrance to the US Embassy in Ankara, Turkey 01 February 2013. At least two people have been killed and two injured in an apparent suicide bombing.